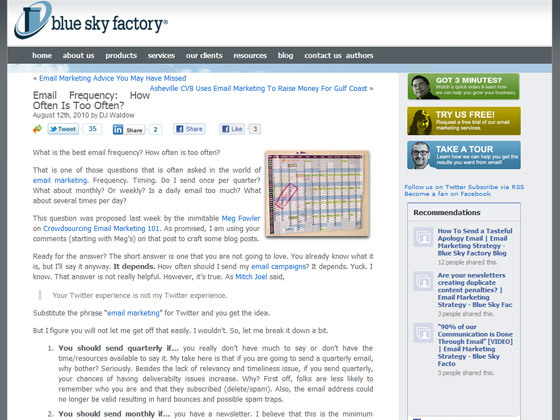 Blue Sky Factory – Email Frequency: How Often Is Too Often? What is the best email frequency? How often is too often? That is one of those questions that is often asked in the world of email marketing. Frequency. Timing. Do I send once per quarter? What about monthly? Or weekly? Is a daily email too much? What about several times per day? This question was proposed last week by the inimitable Meg Fowler on Crowdsourcing Email Marketing 101. As promised, I am using your comments (starting with Meg’s) on that post to craft some blog posts. Your Twitter experience is not my Twitter experience. 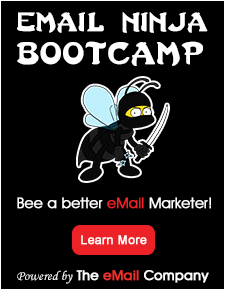 Substitute the phrase “email marketing” for Twitter and you get the idea. But I figure you will not let me get off that easily. I wouldn’t. So, let me break it down a bit. You should send quarterly if… you really don’t have much to say or don’t have the time/resources available to say it. My take here is that if you are going to send a quarterly email, why bother? Seriously. Besides the lack of relevancy and timeliness issue, if you send quarterly, your chances of having deliverabilty issues increase. Why? First off, folks are less likely to remember who you are and that they subscribed (delete/spam). Also, the email address could no longer be valid resulting in hard bounces and possible spam traps. You should send monthly if… you have a newsletter. I believe that this is the minimum frequency. Typically, a monthly email is not intended to sell product or services (but it can). The goal is often to inform, keep people in the loop. At Blue Sky Factory, we send out Factory Direct monthly (subscribe now!). It’s meant to keep our subscribers up-to-date on the latest happenings at Blue Sky Factory. We include recent blog posts, upcoming events, and other tidbits of email knowledge. I’ve seen many universities have success with a monthly communication. Blue Sky Factory partner and friend Jason Falls sends a monthly newsletter. However, if your goal is to sell a product or service (think: conversions), monthly is too infrequent. You should send bi-monthly (2x per month) if… you are just not sure (kidding!). This is the sweet spot for most. It’s a nice balance between monthly and weekly. Most organizations and/or individuals can crank out solid content every few weeks. It’s doable. It’s repeatable. That being said, this is where some pause and say, “Do we have enough to say every other week?” My answer is, “I hope so.” If you are worried about not having enough content every other week, think about ways to pull existing content (blog posts, press releases, website copy) and repurpose. You should send weekly if… you are selling a product or service. This would be the minimum. If you have a sale or an updated service offering or new product, let your subscribers know about it every week. Some choose to send on the same day and time every week. That’s up to you. I’d recommend testing – always. Remember also that you don’t have to pump out a ton of copy in each email. It can be simple – short and to the point as our client and friend Jason Keath does with The Social Fresh 7. Feature a handful of products. Promote a few blog posts. Give some tips (plug for Blue Sky Factory’s 52 Tips).